Description: Light weight Ribbed front construction with International quality protection. Premium quality wipe clean PU facing for comfort and durability. Top hat construction gives greater 35 digree to wrap around the thigh. Carbo-reinforced" guard giving the cricketer International protection. 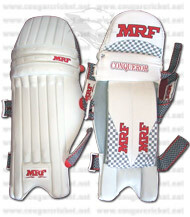 Excellent foam protection, weighing 40% less than traditional legguards. Pro-Fibretec" inserts creating additional anti-shock protection. Extra wide lead leg protection. 2" ankle and calf straps reducing Achilles and calf muscle strains.